Why A Trump Win Is Hugely Bullish For Gold | Energy and Gold Ltd.
A Fed rate hike cycle is pushed out even further and there is a better than 50% that there will not be a December rate hike. Trump’s economic policy proposals are likely to shave a considerable amount off GDP growth due to trade protectionism, this will result in more accommodative monetary policy for longer. Trade protectionism and weaker growth are dollar negatives. Trump is a wild card and much more of a destabilizing President than a President Hillary Clinton would be, gold does better in a chaotic backdrop as a flight to safety asset. Foreign central banks are more likely to be accommodative in their monetary policy stance to counteract what they deem to be a chaotic environment in the US. 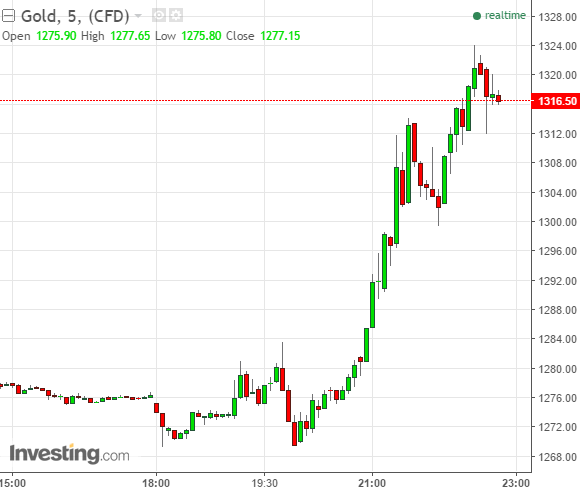 Gold investors have just been rewarded for their perseverance and with the yellow metal surpassing $1320 in overnight futures trading the key $1310 level becomes support once again.